Great idea, but I thought the elc had gone? A second hand one may have damage that can’t be seen, especially with the way some kids are rough on it. What’s the point of saving when it will probably cost more to repair?? I really don’t see the sense in that. Blatant false advertising with how they've photoshopped those kids on making it look twice the size it actually is! Wondered how it works, then saw the weight- 13kg? Was wondering whether it'd be good for a villa in the summer, not at that weight! This looks like the future of travel and something I need. This deal floats my boat! Nee-naw, nee-naw. Look out, it’s the fun police. You could try anchoring it to the beach in some way? Surprises me that a large franchise would risk it, public liability insurance covers commercial bouncy castles only - this is clearly a domestic use product. Trust for this price this is good value. I have this and I have a 3,7,9 yr old who spent most of their summer days when at home in this bouncy castle. The kids love the slide and yes although it is not as bouncy you got to remember that it’s not a commercial one. So you really can’t compare it with those. 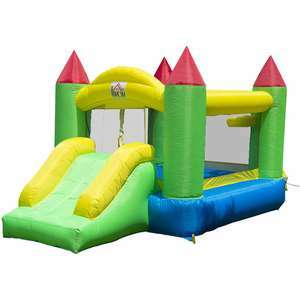 For the back garden it’s perfect , yes it takes quite a lot of space when inflated but that’s because of the slide. It comes with the pump and the storage bag and repair patches. The only problem i had with it was taking it out and then at the end of the day packing it in its bag and bringing it back inside the house. 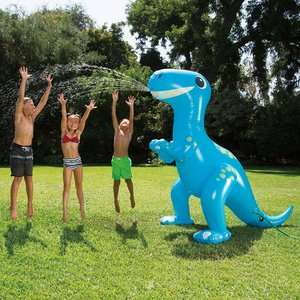 Never miss a 'Inflatable Toys' deal again! Im regretting not buying one myself now, but I just wouldnt have anywhere to put it up (lol) Bouncy castle squashed into the kitchen might not go down well! Bouncy playground for children. 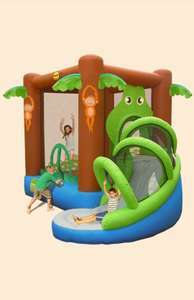 Features a trampoline and a slide for excitement-packed games. I bought this last winter and my daughter (13months) and neice (36 months) loves playing on it this year and will use again next year. Very easy to put up self inflates in minutes. Spotted in Tewkesbury, Aldi, Crane bouncy castle from £69.99 down to £39.99. 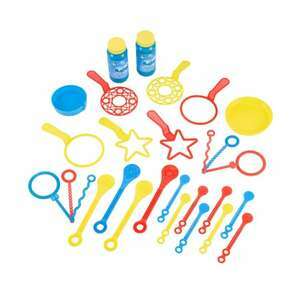 Includes air pump. Bargain! Approx 8 left at around 4pm today. Didn't even bother to bring it home. You should of been able to get a refund due it being faulty. Avoid like the plague. I bought an inflatable swim ring from Prinark in June for my holiday in July. Got to the pool and tried to blow it up then realised the seam wasn't sealed at all. I couldn't return it as I'd had it longer than 28 days by the time we got home. Waste of money. Unable to find on website. Have two of these and chair to match, bought for camping. They lose a lot of air each day and need pumping back up daily. Anyone else think of Featherstone? Useful little camping pillow, same material as an airbed with flock surface. Was 1.49 but clearing at 50p, loads of stock in Romford market store. Great little pillows, use them as lumber support on planes. Bouncy Council House (lol) You should take that on Dragon's Den on something! doesn't look like much bounce in it?